Our empty organic vegetarian capsules are completely toxin-free. Unlike traditional gelatin capsules, our vegetarian capsules contain absolutely no animal products. Our vegan capsules are made from pullulan, a substance derived from water extracted from fungi grown on starch substrate, similar to the way a mushroom grows on fertile ground. No toxic chemicals are involved in the production or extraction processes, so the product is very natural and environmentally-friendly. And of course, there are no excipients or additives of any kind, like sodium lauryl sulfate. Have visual appeal. 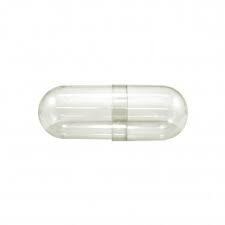 Organic capsules are brillantly clear and visually appealing to your customers! Currently available in clear in sizes 00, 0 and 1. Our HPMC vegetarian capsules are available in these sizes as well as 2, 3 and 4 and are also available separated. See all our HPMC capsules including Herbal Oil and Enteric capsules. Looking for standard (non-organic) Pullulan Capsules? Our pullulan vegan capsules are available in sizes 000, 00, 0 and 1.